As an interior designer, I always draw inspiration from fashion. A piece of jewelry, the fabulous trim on a blouse, or even a button detail can inspire rooms that we design. 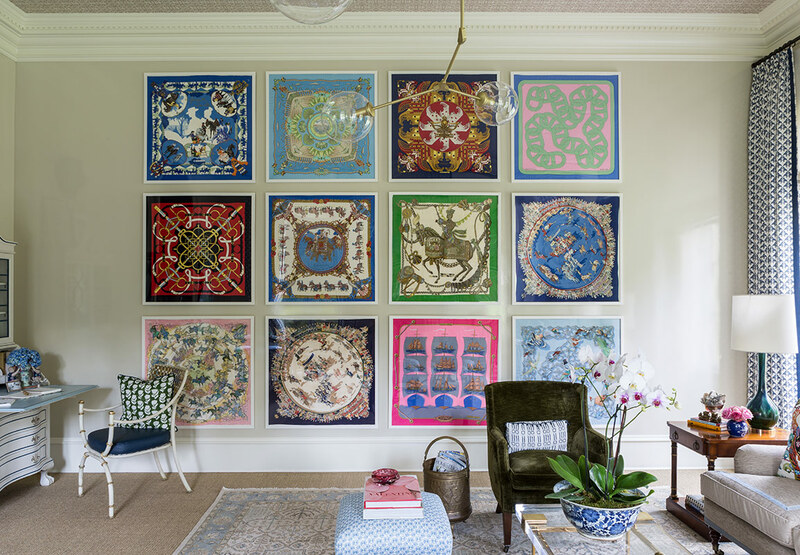 For last year’s DC Design House, the inspiration came from a collection of vintage Hermes scarves. The colors and textures served as art work for a large wall and were quite the conversation starter! Making a statement in a room, or in the way you dress, is a delicate balance. Finding just the right bold color or pattern, or accessory, can create a “wow” moment. Overdoing it can give you a headache! Let’s talk about making just the right statement. The classic Hermes scarf is at once colorful and neutral. It’s entirely unique in its ability to blend. I am always in awe of how the fabulous designs of Hermes can be so dense with pattern, yet work with absolutely everything. Any outfit, or interior, can be complemented by these silk scarves. Some of my favorite design elements pick up on a fashion theme, but in a much less obvious way. In the way that the perfect clutch or bracelet can define a look, a light fixture or sconce can set the tone for a room. These sconces remind me a fabulous pair of horn rimmed glasses. This fabulous light fixture we installed over a Saarinen kitchen table is sculptural and organic. As a design element, it defines this space and ties the contemporary table with the more traditional drapery fabric (Schumacher’s Imperial Trellis). Light fixtures are an easy way to make a statement in any room. Or, in this case, it ties the different design elements in the room together. Notice how the curves of the fixture echo the oval table and the blue and white trellis pattern. The fixture reminds me of this Proenza Schouler bracelet or a statement necklace by one of my favorite jewelry designers, Lizzie Fortunato. This amazing Penny Morrison fabric we used for window treatments completely defines this room. In the same way a bold pattern used on a clutch, shoes, or if you’re really daring, an entire dress, can make a huge impact! Here are a few more of my favorite statement pieces in fashion and decor.